My daughter wants to be an astronaut. How do I help her? What Can I Do to Help My Daughter Become an Astronaut? NASA astronaut Mike Fossum during a spacewalk on July 12, 2011. The most important thing is to support and feed her interest without taking control of her interest. You have to be constantly ready to offer up something, but she has to feel that she is in charge of her own future. So your job is to find resources and opportunities for her. Least expensive options: There’s a lot of great information available for free on the Internet. Visit the NASA Kids Club to find puzzles, games, and other activities for kids of varying ages. NASA’s Space Place is also a good site to find information, activities, games, puzzles, and quizzes. NASA has designed its website so that it can easily be filtered for kids based on grade level: grades K-4, grades 5-8, grades 9-12. NASA’s astronaut biographies can help her learn about past and future astronauts and can be very inspiring. It’s a great way for you to help her see that although it involves a lot of hard work, it is certainly a feasible path for a young girl. Maybe give her a biography a week to read. She can learn about people like Sally Ride, Ellen Ochoa, Peggy Whitson, and Tracy Caldwell Dyson. For a young girl, you might also find inspiration on the NASA women of STEM site. Use Quora. You and your child can have some great conversations that will feed her interest and help her learn. Come to Quora and look up space-related questions. Or if she has a question and you don’t know the answer, come here and ask it. People like me will be happy to answer it for you. If your TV provider offers NASA TV, check it out. If they don’t, you can view it online. Most expensive options: NASA has an initiative called Passport to Explore Space. It’s a program through which kids complete a passport by visiting all 14 NASA visitor centers and space shuttle museum exhibits. They are scattered all over the country, from California to New York, so this could be an expensive endeavor. I know it’s not something my parents could have afforded when I was a child. If you decide to visit a NASA visitor center, be sure to look online first to see if there are scheduled activities. You might be able to have lunch with an astronaut. There are also great Space Camp programs at the Kennedy Space Center in Florida and at the Marshall Space Flight Center in Alabama. Kids of all ages can participate in day or week or longer programs that give them hands-on experience. Most of the rest you and she won’t need to worry about until she is in high school. To help your child grow into a great candidate for the astronaut program is a holistic effort. She’ll need to build both her mind and body. NASA looks for well-rounded applicants. She will need to do well in all her school subjects and should engage in athletics too. Cross-country running is very popular among many astronauts. Astronauts come from many backgrounds, so she has a lot of options. The three most common are engineer, pilot, or medical doctor. But NASA has selected chemists, Navy SEALs, and more. She should choose a path that she could live with, because she will have to live with it for a while. 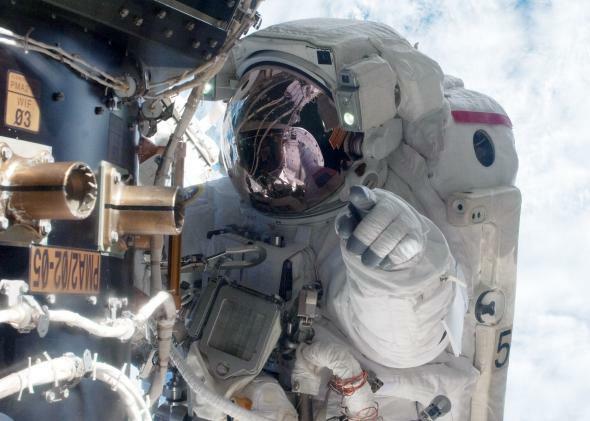 Being an astronaut is not a first career—it is a second career. Her priority should be to excel at that first career, because the astronaut selection panel isn’t impressed by average. What types of selections NASA makes for each class depends on its needs at the time. Sometimes it needs to backfill pilots who have left. Sometimes it needs to beef up the mission specialist ranks. The safest path is probably to combine engineering and being a pilot. Apply to a university with a decent aerospace engineering department and ROTC program. Get that bachelor’s in engineering, go into the military, and train to be a pilot. Excel as a pilot, and in her spare time allow the government to pay for her master’s degree. Education and career achievement are not the only things she needs to be working on, though. Do things: scuba dive, learn to fly, teach classes, volunteer for charities, be a scout leader, travel, learn to speak Russian, engage in competitive sports. The selection panel is looking for dynamic, self-motivated individuals who can learn quickly, handle stress, take orders, and communicate well with the public. Astronauts: Could an astronaut play football at space? Parenting: Is it wrong to compare raising children with training dogs? NASA: What tech upgrades does the Orion ship have compared with those used in the Apollo missions?